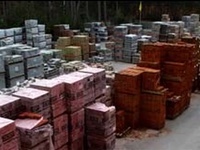 We have a constant supply of closeout thin brick. Our close out brick selection is constantly changing, and we always have interesting selections to choose from. Because our inventory changes so frequently, it is necessary to contact us to see if we can meet your brick needs. Close out brick is typically priced at a fraction of the cost of new brick. Our closeout brick selection comes from over buys, discontinued colors and reclaimed sources. Check out our full featured Advanced Thin Brick Calculator for project estimates. Please contact us with specific details (sq.ft. of project and zip code for shipping location) for a quote.